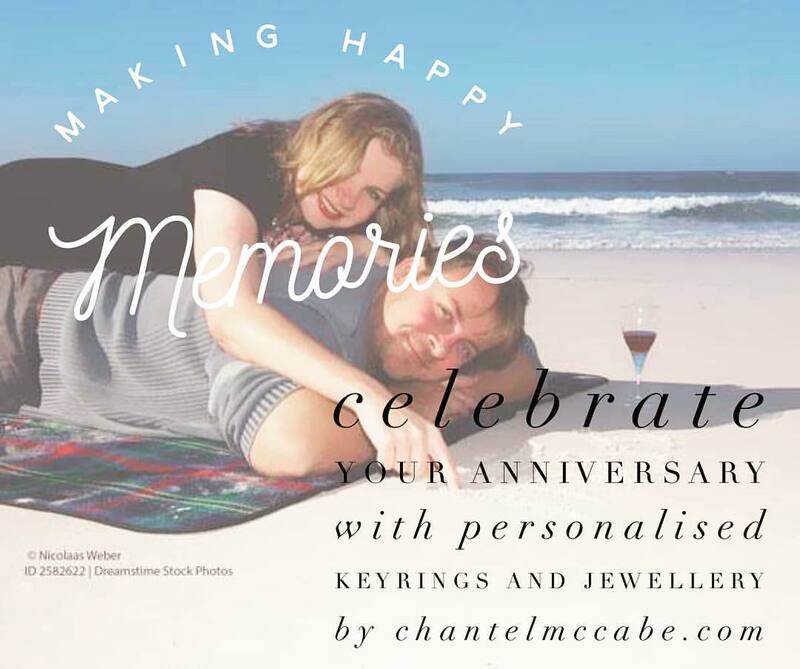 ... anniversaries, weddings, birthdays, personalised keyrings, graduation gifts, Mother's Day and Father's Day and for name, motivation and motto jewellery. My jewellery is stamped and not engraved. It is made by myself in Perth, Australia. I work mainly in sterling silver, Argentium sterling silver, 9 carat gold and gold-filled. Bronze, brass, copper, aluminium and shibuichi also feature in my work. I specialise in thicker, more substantial pieces that stand the test of time and allow for stamping on both sides. My keepsakes are often worn daily for years. New copper and bronze jewellery designs coming soon! Gemstones are also featured in my work. I have several different types of gemstone beads in stock and these are particularly good to add to anniversary and birthstone jewellery. 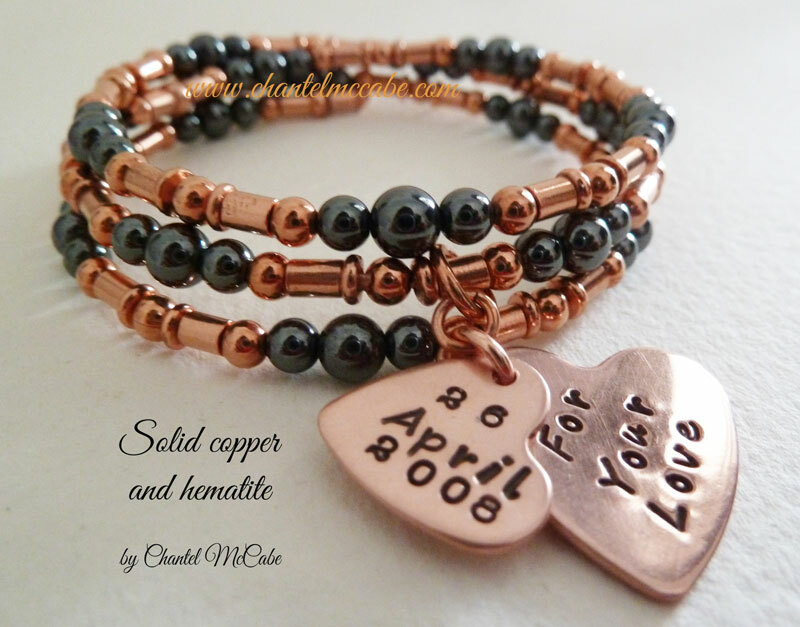 For example, tourmaline and bronze make a great combination for an 8th wedding anniversary. I have discontinued the use of animal-derived materials such as leather and pearls in my work in support of a vegan lifestyle. See my Etsy shop for my latest designs. Click the red "shop now" button. 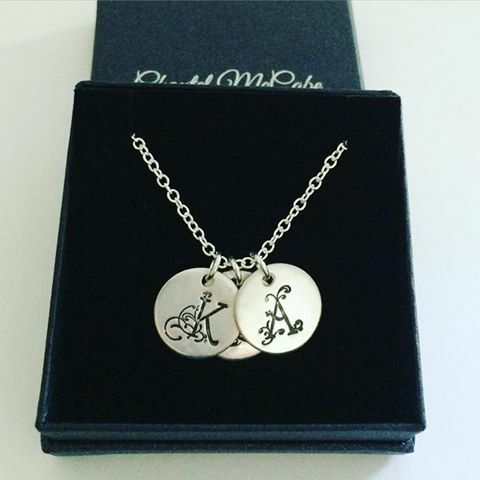 My new style family pendant featuring these gorgeous initials! You can add as many charms as you require to the necklace. Click on the photo below to see my Etsy listing. I have also listed a single charm necklace and single charms which can be ordered separately and added to the either of the two necklaces as required. This necklace can also be made in gold-filled, copper, brass and bronze. The chain style will, however, vary. 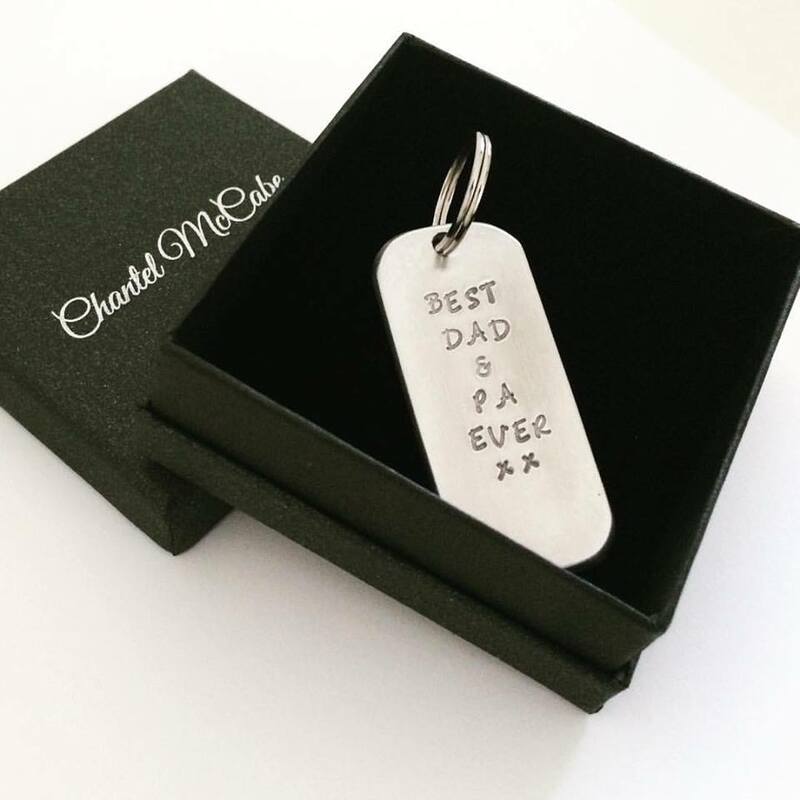 These charms can also be made for you in 9 carat solid gold (yellow, pink or white) by special order so they will require a bit of extra time for manufacturing. You will, however, need to supply your own chain as I do not stock 9 carat gold chain. 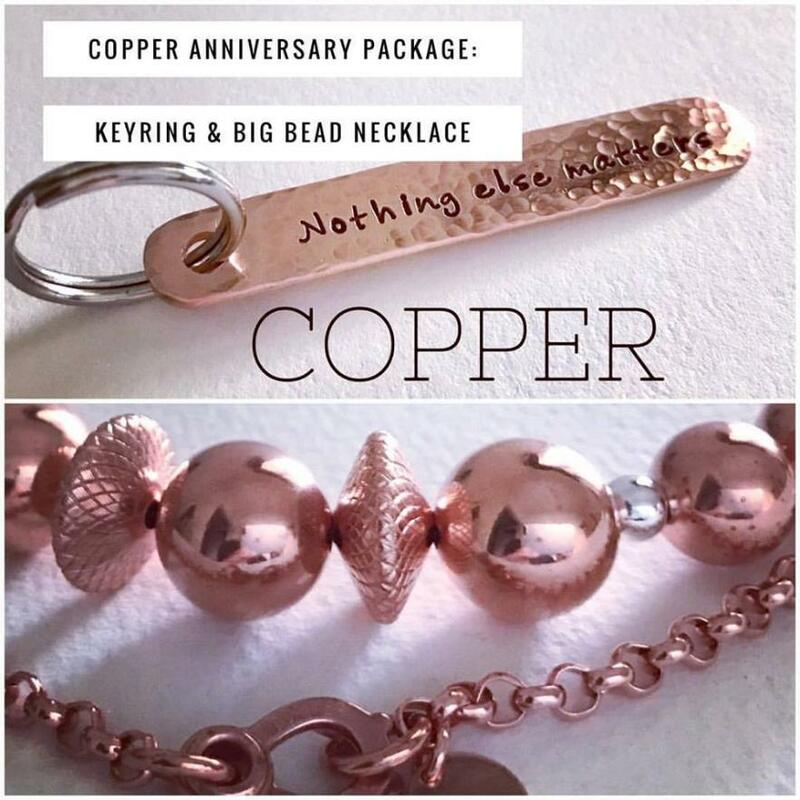 I'm currently running a special offer on these two solid copper items: my popular personalised, narrow copper keyring and my new big bead necklace. You pay less for the two when ordered together in this offer than if purchased separately.Click on the photo below to see the offer in my Etsy shop. I work in a wide variety of metals and many are suited to specific anniversary gifts on both the modern and traditional charts. For instance, aluminium is for your 10th anniversary and copper is both for your 7th and 22nd anniversaries. I also work in bronze (8th), brass (21st), silver (25th) and gold (50th). 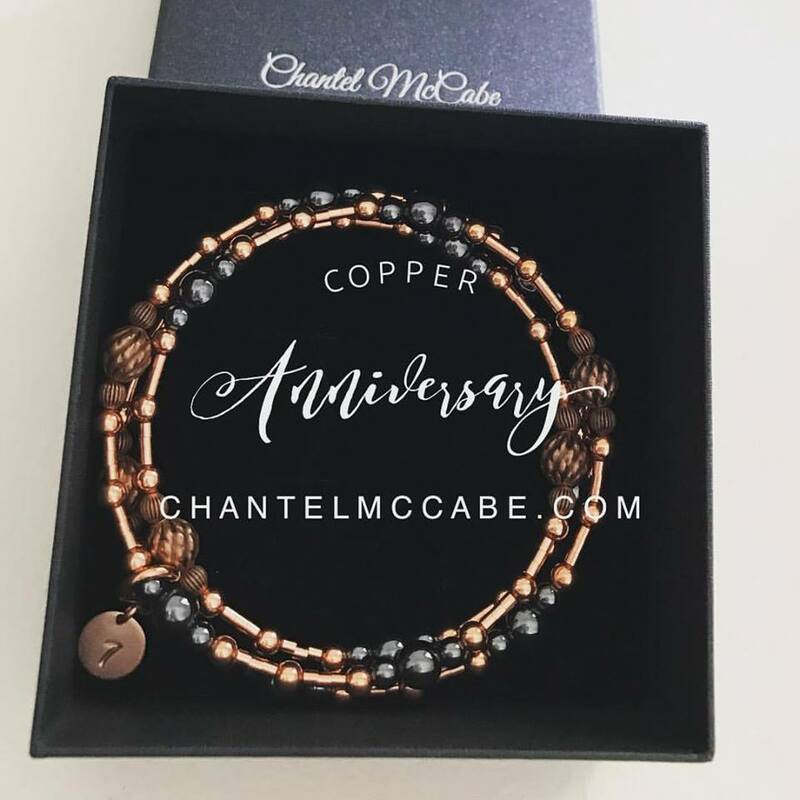 Crystal is for your 15th and I can offer a creation with using a leading brand of crystal beads, plus I stock some of the gemstones for various years. You sometimes need to look across a variety of these gift charts from a few sites to get ideas. 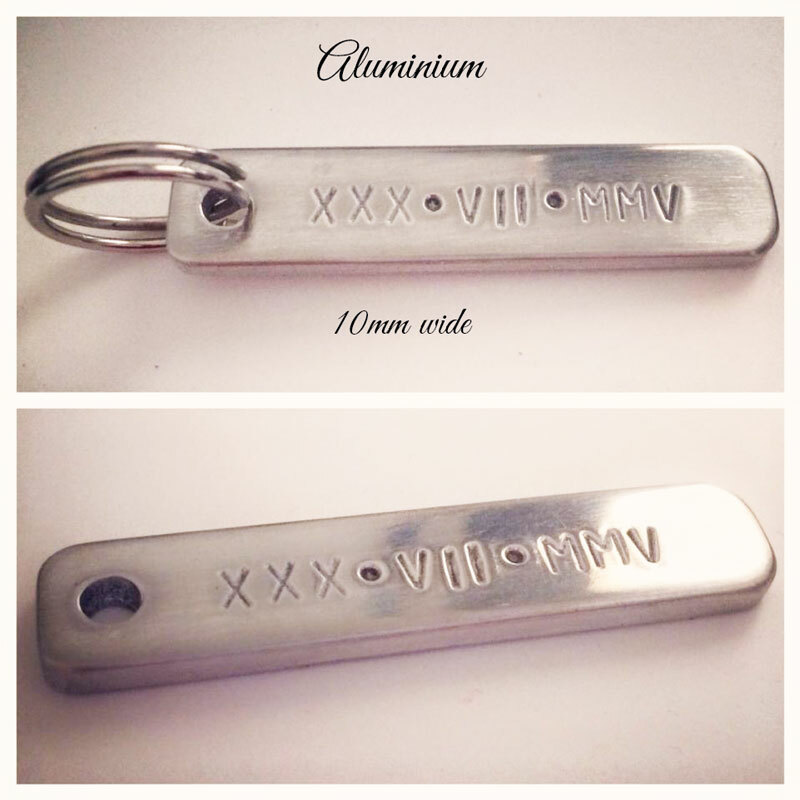 Personalised keyrings make the perfect gift as they are something that can be used every day. My revised 7th anniversary bracelet can now be ordered. A similar design is also available in antiqued brass. Brass is an alternative metal for a 7th anniversary. Original design below and new design above. The new design can also be made with the two heart charms as shown in the old design. Neither this website nor my Etsy shop can offer Afterpay BUT our sister website, Little Red Squirrel, is a fully operational e-ecommerce site and it does have Afterpay as a payment option. Our "nuts about you" collection of personalised keyrings has been listed over there, together with an assortment of other squirrel and woodlands theme products. 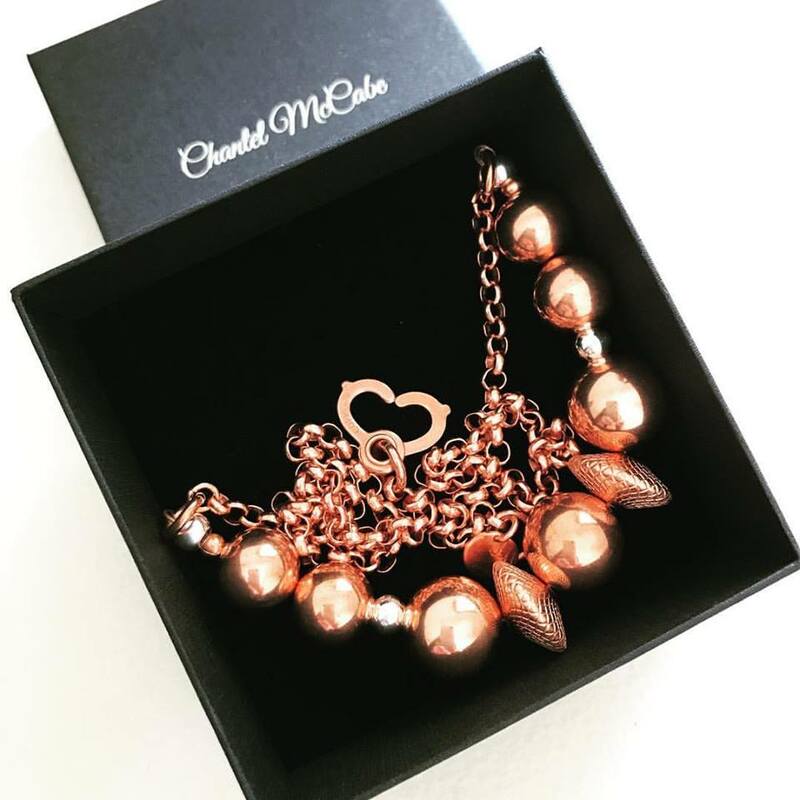 Please enquire if you would like us to create a special listing for you on Little Red Squirrel if you would like to use Afterpay to buy one of our other jewellery items that does not appear on that website. New gemstone jewellery is being added to my Etsy shop regularly. Big bead copper necklaces made out of pure copper and sterling silver. Click on the photo to purchase through Etsy. All orders are beautifully packed and ready to be given away as gifts. I supply a complementary silver polishing pad too. Parcels are sent by Australia Post with a tracking number. Australia Post insurance is available upon request. 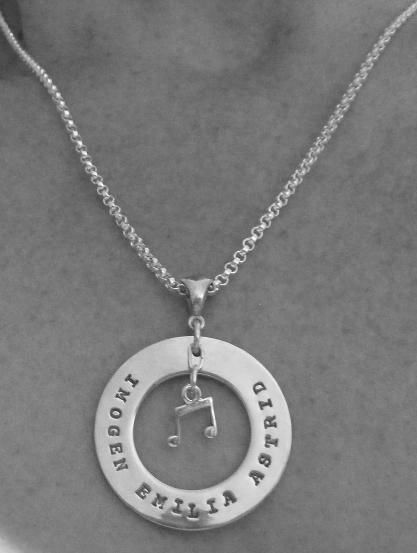 Contact me today and we can start working on your own treasured stamped metal jewellery order! 2. FOR EXISTING DESIGNS LISTED ONLINE - Place an Etsy order or through my online shop on this website. People keep and treasure the jewellery I make for years. 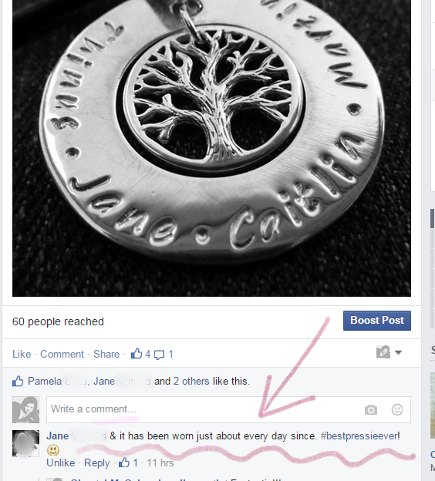 See the feedback below: this pendant was received in January 2013 and as at February 2015, it had been worn almost every day! Sign up for our infrequent newletters, updates and special offers here. I manufacture personalised jewellery in Perth, Western Australia in accordance with the following principles set out in the two posters below. First, I make all of my jewellery myself. That statement does need some qualification! I make some of my components myself and I purchase some readymade components too. I usually make all my own stamping blanks from sheet metal but sometimes I outsource the die cutting of the very thick ones. On rare occasions I might need to outsource an element of a piece to a local manufacturing jeweler. 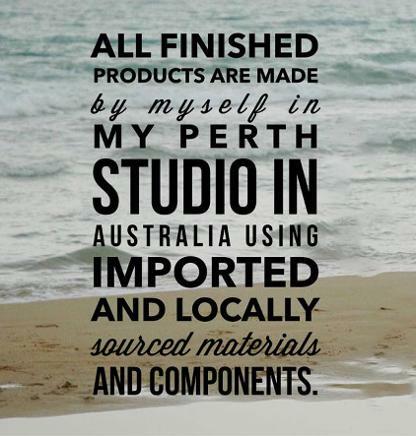 Wherever I can, I purchase supplies from Australian suppliers, whether they are actual manufacturers or importers themselves, but I often need to make purchases of tools, components and materials from abroad due to the nature of my work. 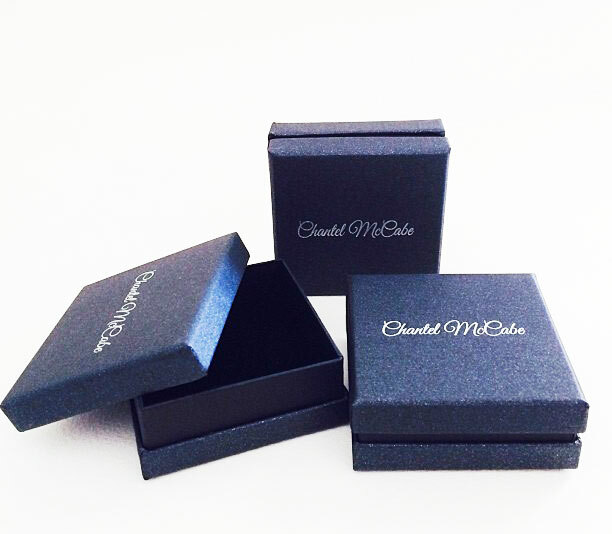 The end result is a piece of personalised jewellery that has been at least partially manufactured by myself and the final assembly and completion is always done by myself in my studio in Perth, Western Australia. This often proves to be very handy for last minute, urgent orders from customers in Perth! 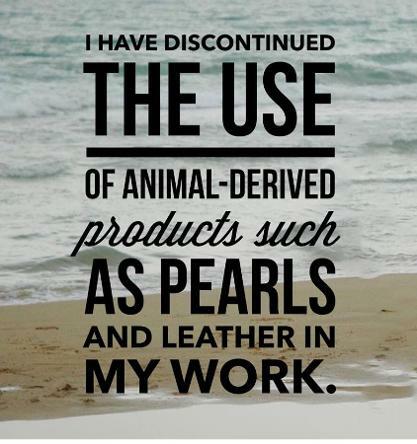 Secondly, in pursuance of a vegan lifestyle and in pursuance of my own vegan journey, I have discontinued the use of all animal-derived products in my work, particularly leather and freshwater pearls. I used to place some of my pendants on black Greek leather chokers. I have substituted this with black latex-free buna cord with highly satisfactory results. Discontinuing the use of freshwater pearls has impacted one of my most popular designs which featured a single coin-shaped freshwater pearl, but this element can be successfully substituted with a myriad of other adornments such as Swarovski (TM) crystal pearls, other beads or metal charms. My goal is to be not only a supplier of "vegan-friendly" jewellery, as most jewellery is in fact "vegan" if no animal products are used, but to be an authentic vegan business servicing the vegan community of Australia, particularly Perth, with personalised vegan jewellery.